Dell Inspiron i3542-6000BK is one of the latest affordable models of Dell, that is versatile and functional- suitable for work and play with a Haswell Intel i3 processor, 4GB memory, 500GB hard drive, Windows 7 operating system and connectivity options like DVD drive, Bluetooth and USB 3.0 port to help you perform your daily tasks efficiently. Dell Inspiron comes with the 4th generation Intel Core i3-4030U (3MB Cache) processor at 1.9 Ghz speed, 4GB Single Channel DDR3 at 1600 MHz to multitask smoothly (4GB x 1), 500GB Serial ATA hard drive at 5400rpm spindle speed as good amount of storage for all your files at fast read/write times (5400rpm may seem to be standard but fast anyway) and the 64-bit English Windows 7 Home Premium which may be one of this Inspiron’s main selling points for many customers that prefer this OS to the Windows 8.1.
i3-4030U was released in the second quarter of 2014 as an ultra low voltage processor, mainly for ultra books. It doesn’t have the turbo boost function but hyperthreading so although it is a dual core processor, it can handle four threads in parallel. Being a Haswell processor you get improved CPU and GPU performance to the previous generation equivalent Ivy Bridge i3 processor. It is more than sufficient for day-to-day tasks, multimedia, office and some games and offers good performance levels overall. 15.6 inch LED backlit HD display with Truelife, 1366 x 768 native pixel resolution and Intel HD Graphics 4400 enables decent and crisp picture quality with vivid colours for still photos or videos while surfing the net or editing multimedia. Intel HD 4400 is up to 30% faster than the HD 4000 graphics card that is very common in budget PCs and is more or less equal to the dedicated Radeon HD 7550M. You’ll hear high definition quality sound through the dual speakers and the Waves MaxxAudio. HDMI port lets you connect your PC to an external monitor or a large screen HDTV to do your things on a bigger screen. The English keyboard is not backlit but comfortable- allows for accurate typing and has the 10 key numeric pad for quick calculations. 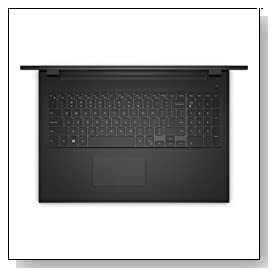 The 40 WHr 4-Cell Battery lithium ion battery is reported to last between 6 to 7 hours in average usage, which would make the battery life another selling point for this Dell Inspiron . Connectivity options include the Tray load DVD Drive that writes to and reads CDs and DVDs, Media Card Reader that supports SD, SDHC, SDXC, Dell Wireless-N 1705 802.11bgn WiFi, Bluetooth 4.0 that is tied to wireless card, Gigabit Ethernet with RJ-45, an HDMI port, USB 3.0 port, 2 x USB 2.0 ports, security slot, webcam and microphone. 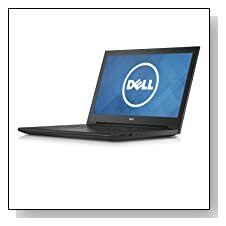 Conclusion: Dell Inspiron i3542-6000BK is a reasonably priced 2014 model laptop that will perform most tasks that more expensive laptops do with its Haswell i3 processor and 4GB system memory. It feels solid and durable as the Inspiron laptops are thoroughly tested for durability and reliability (keys, buttons, hinges, battery, resistance to heat, protection of parts etc.). Windows 7 operating system and long battery life are two of its best features. Screen is non-touch but the image quality is great for the price level. The Inspiron is reported to work rather quietly- without the overheating problems. It comes with 12 months Mail-In Warranty, including In-Home Service following the remote diagnosis and 90 days of 24x7 customer phone support which is claimed to be America’s best.